Well Happy New Year to you all! 2015 was quite a ride, and I’m happy to say things are moving forward pretty well as we enter 2016. Thanks to everyone, family, friends, suppliers, and customers for helping 2015 turn out as well as it did! And a very special thanks to my parents for their long-distance voices of sanity, and to my very good friend Larry for being my good luck charm. As each new year comes along, I take extra time to review the previous year as a whole, look at the big picture and relate it to the little pictures that came as the year progressed. I like to make sure that my impression of our progress in relation to goals is somewhere close to reality. I look at a lot of data, and I look at the bottom line too. I actually started this process toward the end of 2015, and I already have some new, very aggressive goals. I’m already in the process of making some changes that hopefully will make Amerivet Services a little less of a seasonal business, and keep the flow of work steady throughout the year. Another thing that’s happening is I’m finally working to shut down the web server that’s been running almost nonstop since 2001. This act in itself is symbolic, because I’m looking to abandon a few legacy processes that could be better served by modern technology and techniques. There’ll be more on that to come as the year moves on, but expect to see a new web site, a more aggressive approach to some of my “side” ventures, and a fresh look at how to make Amerivet Services grow. As spring comes around you can expect to see woes of winter usage disappear from the truck, with new paint and tool boxes. You will be proud when Amerivet comes to your door. And as usual, I’ll be looking for more equipment to add to our inventory. I really think we need a manlift or two, and of course you can never have enough welders and fabrication tools. Last year I added two welders (one of them on a trailer), a plasma cutter, an 8 x 12 band saw, and an all-terrain forklift to our inventory. I’ll be adding new capability to the business, and new equipment will naturally be needed along the way. Last year, because of the challenges we had at home, business was pretty much flowing naturally, without me continuously trying to muscle things to happen. 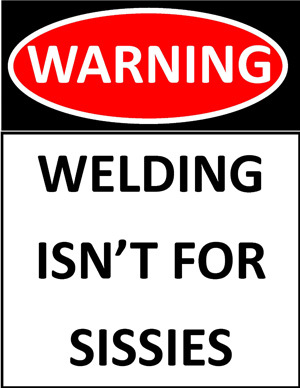 One of the things that came to light because of this is our customers’ need and want more than “just welding.” Sure, we’ve had meanderings down this road in the past, but last year our customers took advantage of our PROBLEM SOLVING skills more than any other year, and we solved a lot of problems that wouldn’t normally come our way. As the year progressed, it was evident that I need to open up our offering in a couple of areas, because a lot of people really need help in those arenas. One of those is already being partially addressed by http://www.amerivetsteel.com. I expect to have that website focused on the entire building service offering by the end of January. The other change will be surrounding industrial equipment. I spent 21 years working on industrial equipment during my Air Force Career, and I have a lot of valuable skills and tricks that should be shared with the world. Last year we had a couple of customers bring us a lot of industrial equipment work, and I think it’s time to make that field a regular offering. I hope to have a business plan for that in place by mid-February, so hang on tight. Springtime will be bringing plenty of new things to talk about! Thanks again for a great 2015. Let’s make 2016 even better!